A day-long standoff between the Punjab Police and three terrorists who had holed up in an abandoned housing complex in the Dinanagar Police Station campus in the Gurdaspur District of Punjab in the early hours of July 27, 2015, ended with the killing of the last of the three terrorists just after 5 pm. A Superintendent of Police and three Home Guards also lost their lives in this gratuitous attack, which included the killing of three civilians in random shootings by the terrorists that led up to the final denouement at the Police Station. Separately, five bombs were found and defused on the Amritsar-Pathankot railway track in Gurdaspur, and initial speculation has linked these to the same group. There are few surprises here: preliminary evidence, including data on two GPS devices recovered from the slain terrorists, indicates that they entered India from the Shakargarh area of Pakistan; while conclusive identification is yet to be made, there is little doubt that these are Islamist terrorists; the pattern of the attack bears striking resemblance to a succession of so called fidayeenattacks in Jammu & Kashmir (J&K); the Centre claims that it had been warning Punjab of an imminent attack for some time; the Punjab Chief Minister Parkash Singh Badal claims that the Centre provided no intelligence of any impending threat and had also failed in its duty to prevent infiltration across the international border. Union Home Minister Rajnath Singh has declared, once again, that India would give a “befitting reply” to this new provocation from Pakistan. Nevertheless, initial reports suggest that talks with Pakistan are to continue and the scheduled meeting of Prime Ministers Nawaz Sharif and Narendra Modi in 2016 is still on. Jitendra Singh, Minister of State in the Prime Minister’s Office, speaking even while the operation was ongoing, asserted that Pakistan’s Inter-Services Intelligence (ISI) – the principal sponsor of terrorism in the South Asian region – was likely to be behind this latest attack. Several commentators also speculated that the terrorists were probably affiliated to the Lashkar-e-Taiba (LeT), the Islamist terrorist formation that has long enjoyed the open and enthusiastic support of the Pakistani state. The scope of the upcoming Indo-U.S. Malabar naval exercise has expanded to a trilateral that includes Japan. This will be the first multilateral Malabar exercise to be held in waters near India since 2007. However, the exclusion of Australia from the Malabar exercise reflects New Delhi’s penchant for hedging against the prospect of Chinese opposition. New Delhi’s cautious approach to the exercise also reflects an institutional aversion to multilateral exercises geographically close to India. Given the rapidly expanding presence of the People’s Liberation Army-Navy (PLA-N) in the Indian Ocean Region (IOR), can New Delhi afford to hold on to these hesitancies while simultaneously pursuing its quest to be the dominant security player in the region? China’s growing naval profile in the Indian Ocean creates a new geopolitical reality that India needs to manage. To adjust its policies to the rapidly changing complexion of the Indian Ocean, New Delhi needs to proactively engage its maritime partners by holding trilateral and quadrilateral naval exercises in the Indian Ocean. Yet while India has not shied away from conducting bilateral exercises, it has a maintained a strong reluctance to hold multilateral exercises in the Indian Ocean owing to Chinese sensitivities. Given that China shows little apparent concern about India’s vulnerabilities in the Indian Ocean in light of the growing China-Pakistan nexus, India should shed its inhibitions and engage in institutionalized multilateral military exercises and engagements in the region. Told and retold from an array of intellectual and emotional perspectives, the story of orgiastic violence and chaos that was India’s convulsive Partition during 1946-48 covers many a bookshelf worldwide. The sordid narrative is depressingly familiar. Mob violence took hold; thousands of women were raped; at least one million people were killed; millions more were injured; and 10–15 million people were forced to leave their homes as refugees. Two longstanding cohesive entities, Punjab and Bengal, were unhappily cleaved into separate nations, and four other British India princely states were fought over by newly fragmented militaries — with one, Jammu-Kashmir, remaining in dispute even today after four shooting wars between India and Pakistan over its fate. From Margaret Bourke-White’s 1949 historic travel photo biographic gem,Halfway to Freedom, to Yasmin Khan’s 2007 historically appealing and emotive, The Great Partition, dozens of scholars, historians, and journalists have plowed the ground tilled by Nisid Hajari in his new book, Midnight’s Furies. Hajari was certainly aware of the challenge of originality. The son of pre-Partition Indian parents and a high-profile journalist, formerly withNewsweek and now Bloomberg View in Asia, Hajari brought a storyteller’s skill and a field scribe’s seasoning in contemporary South Asian security challenges to his task. His aim — and his narrative purpose — was to understand how the experience of Partition carved such a deep and seemingly insurmountable chasm between two countries, India and Pakistan, that otherwise seem to have so much in common. The army on Monday released footage from a small quadcopter it had downed over the Line of Control (LoC) earlier this month, claiming that it presented irrefutable evidence that it was flown by Indian Army for reconnaissance inside Pakistan. According to a statement and corresponding video released by the Inter Services Public Relations (ISPR), that Indian forces had acquired the drone via a contractor before deploying it at a post close to the LoC. The army said that India was exhibiting aggressive posturing through enhanced troop movements, extensive reconnaissance, targeting of civilians and increased use of Unmanned Aerial Vehicles (UAVs) and drones violating airspace of Pakistan. The ISPR further claimed that an image taken before a test flight, at the forward base, indicated a company headquarters of the Indian military, adding that initially the drone just flew over the post and surveyed the Indian side of the LoC with Indian flags clearly visible. The Pakistan military is ambivalent toward the United States yet largely dependent on U.S. military aid. 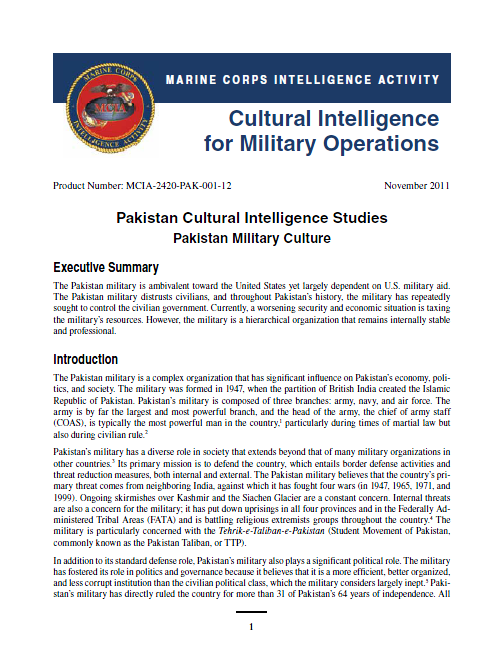 The Pakistan military distrusts civilians, and throughout Pakistan’s history, the military has repeatedly sought to control the civilian government. Currently, a worsening security and economic situation is taxing the military’s resources. However, the military is a hierarchical organization that remains internally stable and professional. Iam a United States Army general, and I lost the “global war on terror.” It’s like Alcoholics Anonymous; step one is admitting you have a problem. Well, I have a problem. So do my peers. And thanks to our problem, now all of America has a problem, to wit: two lost campaigns and a war gone awry. I was never the overall commander in either Afghanistan or Iraq. You’d find me lower down the food chain, but high enough. I commanded a one-star advisory team in Iraq in 2005–06, an Army division (about 20,000 soldiers) in Baghdad in 2009–10, and a three-star advisory organization in Afghanistan in 2011–13. I was present when key decisions were made, delayed, or avoided. I made, delayed, and avoided a few myself. I was on the ground a lot with small units as we patrolled and raided. Sometimes I was communicating with strategic headquarters in the morning and then grubbing through a village with a rifle platoon by sunset. Now and then, Iraqi and Afghan insurgents tried to kill me. By the enemy’s hand, abetted by my ignorance, my arrogance, and the inexorable fortunes of war, I have lost eighty men and women under my charge, with more than three times that number wounded. Those deaths are, as Robert E. Lee said at Gettysburg, all my fault. What went right in this war involved the men and women who fought it. At the tactical level — the realm of vicious firefights and night raids — the courage, discipline, and lethality of our Americans in uniform stand with anything accomplished in the Civil War, both world wars, Korea, or Vietnam. After many false starts, Afghanistan, Pakistan and the Taliban are now settling on the starting blocks. This will be a marathon, not a short race, and will not end so long as the Taliban and Pakistan talk peace and pursue violence. Can negotiating with the Taliban result in peace and stability in Afghanistan? Eventually perhaps, but not under the current circumstances. Not while its government is hobbled by economic meltdown, is short on international assistance, and its security forces are struggling, at great sacrifice, to hold their ground against a resurgent Taliban. Afghanistan President Mohammad Ashraf Ghani thinks he can achieve, through persuasion, what the United States failed to get by coercion. He applauded the first, direct meeting at Murree, Pakistan, on July 7, between a Taliban delegation and representatives of Afghanistan’s government and High Peace Council (HPC) as “the biggest achievement of Afghanistan over the past 14 years.” A follow-up meeting is days away. At Murree, as at the preceding track-two meetings in earlier weeks in Doha, Dubai, Oslo and Urumqi (China), the Taliban committed to safeguard the “lives, honour and properties” of Afghans. This was flouted within hours of Mr. Ghani’s statement, as the Taliban attacked civilians in Khost, Kapisa and Baghlan, including a congregation gathered for iftar, killing scores of persons. So the Burmese government has finally set a date for the next national election. That’s good news. At least we know that there’s definitely going to be a vote. The government’s dithering had raised fears that it might be angling for a postponement. Yet Burma’s tribulations are far from over. The country’s nascent democracy is in deep trouble.The country’s nascent democracy is in deep trouble. And you don’t have to rely on me as the source. Just ask the Burmese. Recently I had the privilege to meet up here in Washington with Wai Wai Nu, a 27-year-old Burmese political activist. She had come to speak with U.S. government officials and human rights organizations, but ended up getting a bit more than she’d bargained for. On June 23, President Barack Obama invited her (and a diverse bunch of American Muslims) to the White House for iftar, the evening meal that marks the daily breaking of the Ramadan fast. Wai Wai Nu is a Rohingya, the Muslim minority that has been the object of considerable violence and discrimination in Burma in recent years. 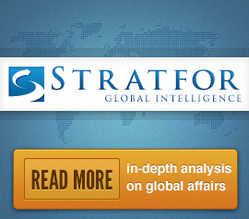 New configurations in Asian geopolitics are emerging thick and fast. Last month saw the initiative of a new trilateral involving India, Japan, and Australia when Indian Foreign Secretary S. Jaishankar met his Australian counterpart and the Japanese vice foreign minister. Japan will also be a part of bilateral India-U.S. annual naval exercises–the Malabar–slated to be held over the next few months. Though Japan has participated in these exercises in the past as well, this will be only the second time when Japan will join these exercises in the geostrategically critical Indian Ocean region. There is a growing convergence in the region now that the strategic framework of the Indo-Pacific remains the best way forward to manage the rapidly shifting contours of Asia. Proposed first by Japan and adopted with enthusiasm by Australia under the Tony Abbott government, in particular, the framework has gained considerable currency, with even the U.S. now increasingly articulating the need for it. Though China views the framework with suspicion, many in China are acknowledging that the Indo-Pacific has emerged as a critical regional space for India and China needs to synchronize its policies across the Indian Ocean region and the Pacific. These developments underscore the changing regional configuration in the Indo-Pacific on account of China’s aggressive foreign policy posture as well as a new seriousness in India’s own China policy. Indian Prime Minister Narendra Modi’s outreach to Japan and Australia has been a significant part of his government’s foreign policy so far as strong security ties with Tokyo and Canberra are now viewed as vital by Delhi. 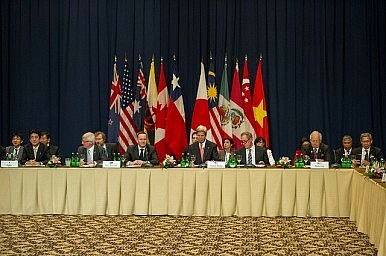 The Trans-Pacific Partnership (TPP) made it through its toughest hurdle in the U.S. Congress last month, after the House and Senate both voted in favor of granting President Barack Obama Trade Promotion Authority (TPA), otherwise known as “fast track,” the ability to negotiate the TPP and other trade deals with foreign countries. Touted as a “21st century trade agreement,” the TPP would bring together 12 nations, including the United States and Japan, encompassing 40 percent of global trade under a progressive, far-reaching free trade deal. Environmental groups, labor unions, and anti-trade activists, have vociferously opposed the “fast track” bill. In contrast, foreign policy analysts in Washington have generally been in favor of the TPP. They argue that failure to reach a free trade agreement with Asian economies would allow China to set the global norms, fearing China’s mercantilist foreign policy would neglect environmental standards, labor rights, and intellectual property rights, and set a low bar for global standards. It’s election season in Burma. The 2015 general election, which promises to be the first more or less free vote of its type in more than half a century, is already looming large. The leader of the military, Senior General Min Aung Hlaing, is already giving glimpses of his strategy for victory: a breakthrough in peace talks with the ethnic rebels who are still at odds with the central government. Burma’s liberalization process has generated high expectations within the international community. What outsiders often tend to miss is that the 60-year-old civil war between the central government and ethnic minorities continues today — despite all the positive talk about peace from the country’s leaders. This is the most daunting hurdle that Burma has to cross before it can establish a stable, open democracy. Min Aung Hlaing has decided to take on this challenge, and has spent the last few months making the rounds among ethnic armies. He has met with some success: In early April, he managed to bring the leaders of all major groups to the table for peace talks in Rangoon — the largest meeting of its kind since Burma achieved independence in 1948. The talks have so far been a success: After the four-day-long peace negotiations, the attendees approved a draft of a national ceasefire agreement. Under Min Aung Hlaing’s leadership, the military has put ethnic reconciliation squarely at the center of its agenda. The reason for this is clear. The Project 2049 Institute in northern Virginia has just issued another very detailed and richly illustrated 25-page report on Chinese SIGINT entitled The PLA General Staff Department Third Department Second Bureau: An Organizational Overview of Unit 61398. The report’s author, Mark A. Stokes, knows his stuff. Stokes focuses the report’s attention on the major Chinese SIGINT and cyber spying hub at Shanghai, whose principal focus is stealing the government, military and economic secrets of the United States. And best still, Stokes tells you where he found his information. If your interest is signals intelligence or Chinese spying, this report is an absolute “must read.” The report can be accessed here. This is the third in a series of reports adapted from the Legatum Institute’s “Beyond Propaganda” program. The Chinese Communist Party has always seen propaganda, known as “thought work,” as key to controlling society. Coordinated by a standing member of the Politburo, propaganda reaches down through every layer of the Chinese state and society, with the military, education, and the arts all mobilized as vehicles for the dissemination of centrally determined messages. But today, China’s propagandists are facing new challenges. One is ideological. In an age when the Communist Party is curating a form of capitalism, what does the party stand for? How should it secure loyalty? What sort of central message should it project? The second is technological. The Internet is designed to challenge centralized control and accelerate horizontal communication, whereas the Chinese state remains a rigidly vertical power structure. As China modernizes, propaganda is an important means of maintaining stability and national cohesion, especially as the creation of the market economy with “Chinese characteristics” has generated a range of challenges — corruption, poor environmental management, uneven development, problems created by mass migration, unemployment, a widening wealth gap — that might spark popular unrest. To stay on top of the game, Communist Party propagandists project deliberately contradictory messages.To stay on top of the game, Communist Party propagandists project deliberately contradictory messages. They emphasize the appeal of history, tradition, and culture, while also striving to project a picture of a modern, dynamic, and transforming China; they remember China’s status as “victim” during the so-called “Century of Humiliation,” while also communicating confidence of China’s growing superiority. Propaganda chief Lu Yunshan has demanded the creation of a “spiritual civilization” to help nurture Xi Jinping’s “Chinese Dream.” But the definition of the Chinese Dream is deliberately vague, embracing everything from a “spirit of rejuvenation” to the recent revival of low-tech, old-fashioned propaganda posters. 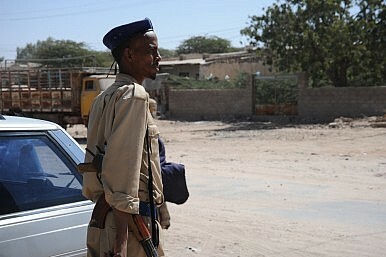 On the afternoon of July 26, an attacker drove a car rigged with bombs into the gate of a hotel in Somalia’s capital, setting off explosions that left 15 people dead and over 40 injured. The militant group al-Shabaab claimed responsibility for the suicide attack, saying that its intended targets were Western diplomats. The Jazeera Palace Hotel, where the suicide bombing took place, was frequented by foreign diplomats, as it housed the embassies of China, Qatar, and the United Arab Emirates. China’s embassy, located on the top two floors of the hotel, was damaged in the bombing. The embassy also sustained casualties in the attack. Adm. Harry Harris, head of U.S. Pacific Command, says the vastly expanded reefs now look exactly like combat bases for fighters, bombers, ships, and surveillance. ASPEN, Colo. – The top U.S. military officer in the Pacific sternly warned China on Friday to immediately cease its “aggressive coercive island building” in the South China Sea, which he argued was intended clearly for China’s military use as forward operating bases in combat against their regional neighbors. Adm. Harry Harris, commander of U.S.Pacific Command, said the U.S. would use military force to defend its interests and its allies against any threats from the islands. “I believe those facilities are clearly military in nature,” Harris said at the Aspen Security Forum, an annual gathering in Colorado of dozens of topU.S. national security leaders, convened by the Aspen Institute. The following is the first public Chinese Military Strategy white paper outlining a new policy of “active defense,” released by the Chinese Ministry of National Defense on May 26, 2015. The world today is undergoing unprecedented changes, and China is at a critical stage of reform and development. In their endeavor to realize the Chinese Dream of great national rejuvenation, the Chinese people aspire to join hands with the rest of the world to maintain peace, pursue development and share prosperity. China’s destiny is vitally interrelated with that of the world as a whole. A prosperous and stable world would provide China with opportunities, while China’s peaceful development also offers an opportunity for the whole world. China will unswervingly follow the path of peaceful development, pursue an independent foreign policy of peace and a national defense policy that is defensive in nature, oppose hegemonism and power politics in all forms, and will never seek hegemony or expansion. China’s armed forces will remain a staunch force in maintaining world peace. Building a strong national defense and powerful armed forces is a strategic task of China’s modernization drive and a security guarantee for China’s peaceful development. Subordinate to and serving the national strategic goal, China’s military strategy is an overarching guidance for blueprinting and directing the building and employment of the country’s armed forces. At this new historical starting point, China’s armed forces will adapt themselves to new changes in the national security environment, firmly follow the goal of the Communist Party of China (CPC) to build a strong military for the new situation, implement the military strategic guideline of active defense in the new situation, accelerate the modernization of national defense and armed forces, resolutely safeguard China’s sovereignty, security and development interests, and provide a strong guarantee for achieving the national strategic goal of the “two centenaries” and for realizing the Chinese Dream of achieving the great rejuvenation of the Chinese nation. 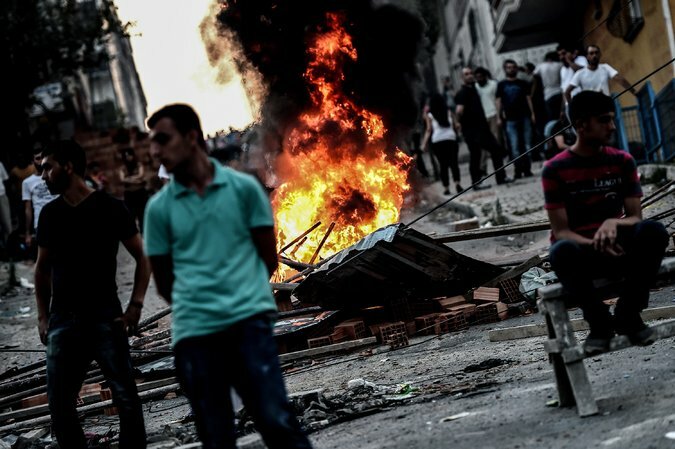 Protests in Istanbul on Sunday after Turkish airstrikes on Kurdish groups. Late last week, Turkey significantly escalated its involvement in Syria’s civil war by carrying out airstrikes against Islamic State targets in Syria and announcing that it would allow American military aircraft targeting the terrorist group to fly sorties out of Turkey. These moves by Turkey, a NATO member that has one of the most powerful militaries in the region and has long been wary of deeper engagement in the Syrian war, could substantially bolster efforts to fight the Islamic State. But that shift was immediately followed by a dangerous development that will create even more turmoil in the region. 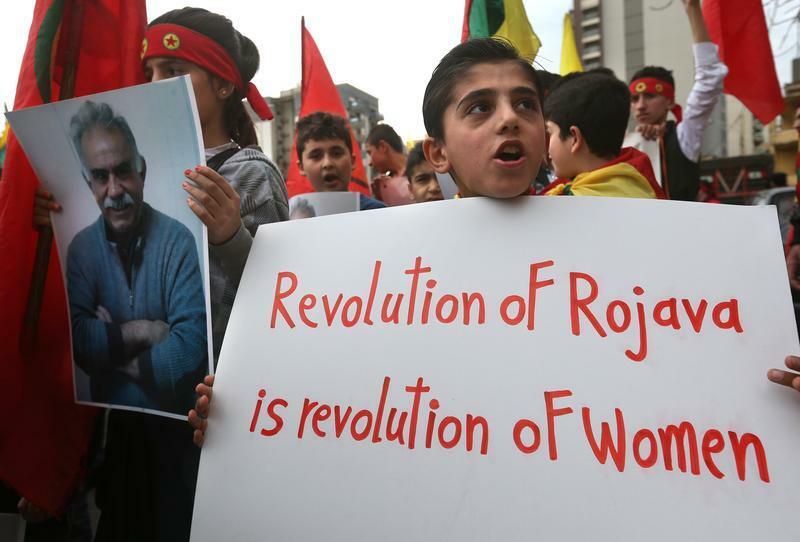 On Friday, Turkish war planes launched airstrikes against the camps of the Kurdistan Workers’ Party, or P.K.K., a guerrilla group that operates out of remote regions in northern Iraq. The attack ended a truce between the Ankara government and the Kurdish militants that has largely held since 2013. Turkey’s opportunistic decision to conflate the risks posed by the Islamic State with its three-decade conflict with Kurdish separatists could set back the broader efforts of the American-led coalition. This new phase of the war against the Islamic State, also known as ISIS,which appears most likely to lead to the establishment of a de facto no-fly zone over regions of northern Syria, is unfolding with virtually no meaningful input from Congress. Having failed to reach a consensus over the scope and nature of an authorization of war that would have set parameters for Washington’s involvement in Iraq and Syria, lawmakers appear resigned to allowing the Obama administration to slide ever more deeply into a complex war. This weekend Turkey and the United States took steps toward getting more heavily involved in the Syrian quagmire. First, after a year of protracted negotiations, Turkey agreed to allow the United States to use Incirlik airbase to conduct operations against the so-called Islamic State. In return, the Obama administration has agreed to the establishment of a "safe zone" in northwestern Syria that "moderate Syrian opposition forces" would protect along with Turkish and American airpower. Second, Turkey undertook airstrikes against Islamic State positions in Syria and the forces of the Kurdistan Workers' Party (PKK) in northern Iraq. The early reaction has focused almost exclusively on Ankara's sudden interest in combatting the Islamic State and the establishment of safe zones as potential "game changers" in the fight against Islamic State leader Abu Bakr al-Baghdadi and the Assad regime. In reality this effort is likely to achieve much less than expected. It is true that the Turks have gotten more serious about the threat of the Islamic State, especially since the Suruc bombing on July 20, but Ankara, which has grown increasingly uncomfortable as the Kurds have made gains against Islamic State forces in Syria, is primarily interested in suppressing Kurdish nationalism. This has placed Washington in the odd position of having essentially given the go-ahead to its most reluctant ally in the fight against the Islamic State to combat some of the most effective fighters in that conflict -the Kurds, both the Turkish Kurds of the PKK and the affiliated forces of their Syrian cousins, the People's Protection Units, known by the acronym YPG-under the guise of combatting the same enemy. This seems like a steep price to pay for the use of Incirlik while threatening to draw the United States into a war with no end. 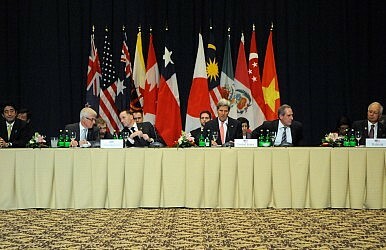 The six world powers and Iran have come to an agreement about the curbing of Iran's nuclear program. But it would be a mistake to assume that this agreement will result in an immediate, or even short-term, decrease in violence or competition among the Middle East's strongest powers. In fact, the opposite will be the case. Iran will use its newfound international legitimacy to attempt to realize its ambitions to become the regional hegemon. Turkey, Saudi Arabia, Egypt, and a host of small countries and even smaller religious and ethnic groups will all compete and at times align for influence. Though reams of bureaucratic red tape remain to be cut in the coming months, it seems likely that the joint accord will pass the U.N. Security Council. Furthermore, it will be extremely difficult for both houses of the U.S. Congress to muster the two-thirds votes necessary to prevent the lifting of certain U.S. sanctions levied against the Islamic Republic. Normalization with the West will give Iran the chance to improve its economy and recruit foreign investment, and will also open up potential relationships that sanctions prevented from developing. Proxy battles and diplomatic rapprochements on the periphery of the Middle East will continue apace, but Iran's primary focus will be on Baghdad. Control of Iraq is the necessary condition for Iran projecting force in the Middle East, whereas lack of control or, worse, control of Iraq by another outside power, would constitute a direct threat. But Iran will have to contend with other regional powers. Turkey, Saudi Arabia and Egypt are the other heavyweights in the balance of power the United States seeks to create in the Middle East. Saudi Arabia hopes to lead a broad Sunni Arab coalition against Iran. Egypt has much in common with Saudi Arabia, but it also has its own ambitions and will bristle at taking a junior role. Saudi Arabia's and Egypt's interests will coincide most of the time, but the partnership will not be without competition. Egypt's domestic concerns, however, will limit how successfully Cairo can play this game. 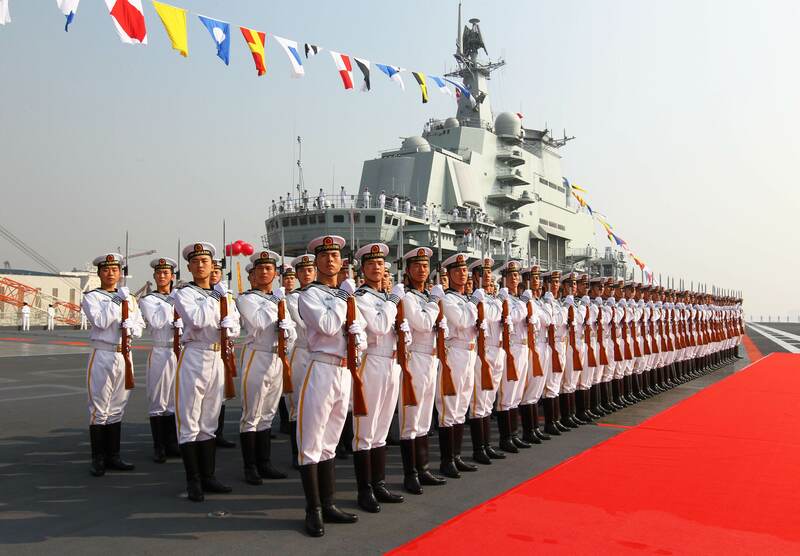 Chinese tourists visit the Qingdao Naval Museum, the only military museum that features the development of China's modern navy, in the coastal city Qingdao, a major port in eastern Shandong Province, on August 18, 2014. The museum is home to a retired destroyer, guided missile frigates, a submarine and fighter jets. China is modernizing its 'blue water' navy at an alarming pace according to the United States, which has America's Asian allies alarmed at the growing threat of naval confrontations with China regarding disputed territorial waters. Much has been written recently about both the U.S. military/naval "pivot to Asia" and China's extensive South China Sea maritime assertions, stirring up territorial claims and counter-claims. But if the possibility of a potential U.S.-China maritime confrontation dominates media coverage, another scenario equally unsettling is rising to the surface -- increasingly assertive naval power projections by both China and India. As their dynamic economies vie for regional influence, displays of military and naval power attest to that economic clout. It is not a situation promoting stability between Asia's two dominant economies, which in 1962 fought a brief but bitter war in the Himalayas. While China's territorial disputes with South China Sea neighbors currently attract the most media attention, China contests territorial issues in Kashmir with India and Pakistan, where land is under the de facto administration of China (Aksai Chin), India (Jammu and Kashmir), and Pakistan (Azad Kashmir and Northern Areas). 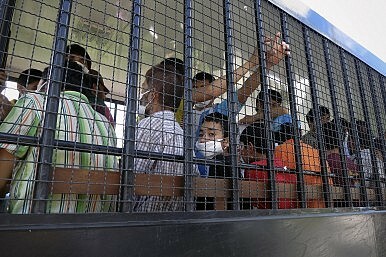 Thailand’s recent deportation to China of more than 100 Uyghurs – the majority ethnic group in China’s Xinjiang Uyghur Autonomous Region – drew a rebukefrom the United Nations. It also prompted a strong public reaction within Turkey, which led to the Turkish government reiterating its determination to receive Turkic-speaking Uyghurs fleeing China. In response, Beijing published a report on home-grown terrorism, claiming that police in China’s Yunnan Province have shot dead “four violent terrorists” and arrested 553 “extremists” attempting to leave China for foreign warzones like Syria and Iraq since 2014. While not making direct reference to the Xinjiang Uyghurs, the subtext to such pronouncements is that the Uyghurs attempting to leave China have strong links with global terrorism, and pose a genuine security threat. Few people outside China knew about Xinjiang or the Uyghurs before news of Uyghur fighters joining the Islamic State started being reported internationally. This is in stark contrast to Tibet, which many view as a historically independent region, and where China’s authoritarian approach has regularly found itself in the international spotlight. President Obama announced on Tuesday that the international community and Iran had struck a 10-year deal to curb Iran’s nuclear program. Reaction in the United States has been mixed. Some view the deal as a positive step toward normalizing US-Iran relations—bringing the Middle East back from the brink of large-scale nuclear proliferation—while others see the Obama administration’s deal as a fool’s errand. In the end, time will tell who is right. One thing that is already clear about the future, however, is that deterrence will remain a pivotal goal of U.S. strategy toward Iran and other potential foes. Because the costs of armed conflict against these adversaries are high, policymakers will look for ways to protect American interests without engaging in open warfare. In this context, it is useful to step back and take a larger look at deterrence and how it works. The essence of the concept of deterrence can be found in the word itself; the root of “deterrence” is the Latin deterre, which means to frighten away. The Department of Defense defines deterrence in similar, yet more specific, terms as “The prevention from action by fear of the consequences. Deterrence is a state of mind brought about by the existence of a credible threat of unacceptable counteraction.” Simply put, deterrence occurs when one can make an adversary believe that the consequences of behaving undesirably will outweigh the benefits. Russian President Vladimir Putin’s bombshell decision in December 2014 to suspend the South Stream gas pipeline, which was to link Russia to Southeastern Europe, and replace it with a new project under the tentative name of Turkish Stream has caused more than a few raised eyebrows in Brussels. Fears that Turkish Stream will block the EU-backed Southern Gas Corridor, which will bypass Russia and bring gas directly from Central Asia and the Middle East to Europe, and undermine EU energy security might be far-fetched and conceptually fallacious. Yet the real problem with the proposed new pipeline is that it is part of an energy security dilemma in which the EU and Russia have been trapped. The construction of Turkish Stream is not written in stone, and it will come as no surprise if the project is eventually scrapped. This would not be the first energy transportation network to be highly publicized by Moscow but never implemented. Besides, the economic viability of the pipeline has been questionable as it remains unclear who will finance the project, how the gas will be transported in Europe, and what purchase contracts will be signed. But even if Turkish Stream is concluded, allegations that it poses a direct threat to the EU’s energy security strategy can be contested. Turkish Stream should be regarded as an alternative route for the transportation of Russian gas, which will remain a basic element of the European energy mix for the foreseeable future. Despite striving for increased diversification of its energy supplies, the EU is nowhere near meeting its target of 100 percent energy independence from Russian gas. Lethal military support to Kyiv will create more problems than it solves. Right Sector members burn tires during a rally near the Ukrainian government building on 3 July 2015 in Kyiv. Photo by Getty Images. As the war in Ukraine has dragged on, lobbying to supply lethal weapons to the Ukrainian government − to supplement ongoing diplomatic efforts, sanctions and the provision of some non-lethal military equipment and training to Kyiv − has increased. Both Prime Minister Arseniy Yatsenyuk and President Petro Poroshenko have argued that the war is Europe’s and the US’s as well as Ukraine’s, and that lethal weapons are necessary for Ukraine to defend itself. ‘Without weapons, we lost Crimea and parts of Eastern Ukraine. This is the lesson,’ said Yatsenyuk. US Secretary of Defence Ashton Carter and NATO figures such as Supreme Allied Commander Europe General Philip Breedlove have also raised the prospect of supplying lethal weapons to help the Ukrainians defend themselves and ‘raise the costs’ to Putin of aggression in Ukraine. But supplying lethal weapons to Kyiv would be a bad idea for several reasons. First, Western weapons alone will not help Ukraine defend itself. The reason Ukraine could not defend itself in 2014 was because of a 20-year degeneration of its military capability. This was in terms of equipment (in 1991, they were among the largest armed forces in the world), and the long-term lack of government support and leadership. Over that time, investment in the military declined steeply, defence ministers changed frequently, corruption became endemic and combat capacity declined (for several years before 2014, no brigade or battalion level exercises were held). Without first addressing this strategic picture – which has no quick fix – more weapons will make little positive difference. Russia inducted a new-generation spy ship into the Northern Fleet on Sunday during navy day celebrations. 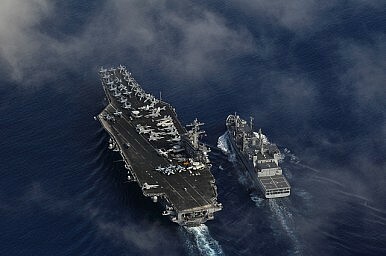 The new vessel will be tasked with monitoring U.S. anti-missile defenses on the high seas, a navy spokesman said. The ship is known as the Yury Ivanov, the lead boat of the Project 18280 intelligence ships designed for the Russian navy. A second vessel of the same class will be launched next year, according to the United Shipbuilding Corporation, news agency RIA Novosti reported last week. The ship was commissioned into the Russian navy during a large naval parade attended by President Vladimir Putin in Russia’s Baltic Sea enclave of Kaliningrad on Sunday. Light on armaments, heavy on sensors and advanced electronic equipment, spy ships are purpose-built to loiter and listen to what foreign vessels are up to. The Yury Ivanov will be specifically equipped to track U.S. anti-missile defenses, which are being outfitted on American warships. Each of Russia’s four major fleets has one or two spy ships in their ranks, but these were built in the 1980s and are ill-equipped to counter the newer U.S. vessels. Each fleet is expected to receive an Ivanov-class ship over the next several years. U.S. missile defenses have repeatedly caused friction in U.S.-Russia relations. Moscow considers the defenses an existential threat to its nuclear deterrence, which the Defense Ministry sees as its strongest guarantor of national security. As Trans-Pacific Partnership (TPP) negotiations continue in Maui this week, Investor-State Dispute Settlement (ISDS) is proving to be a hot domestic topic in party countries. ISDS is a provision in bi- and multi-lateral investment agreements and treaties that allows investors to sue states over treaty breaches. The investment chapter of the TPP will almost certainly include an ISDS procedure. ISDS has been subject to negative criticism by prominent politicians and parts of the media across most TPP party countries. Some believe that state sovereignty would be compromised by the inclusion of ISDS in the TPP. A New Zealand politician has brought a bill before Parliament to outlaw free trade agreements that include ISDS. Others are concerned that ISDS cases are frivolous and waste government money. Many of these concerns have been overstated and deserve to be corrected. A More 'Flexible' US Approach to North Korea? We’ve long heard murmurings of a return to negotiations over North Korea’s nuclear program—China has suggested returning to talks unconditionally, whereas top U.S. officials have repeatedly emphasized that no negotiations can take place without North Korea making a bona fide gesture that suggests that it will entertain the prospect of giving up parts of its nuclear weapons program. The most clear statement of what the United States was looking for included, as U.S. Assistant Secretary of State for East Asia Daniel Russel noted last year, an acceptance of the 2005 Six-Party Talks joint statement. On Monday, reports emerged citing comments by Sydney Seiler, the U.S. special envoy for the Six-Party Talks (which have been on hold since they disintegrated in 2009), noting that the United States may be open to approaching the North Korean regime with fewer preconditions. 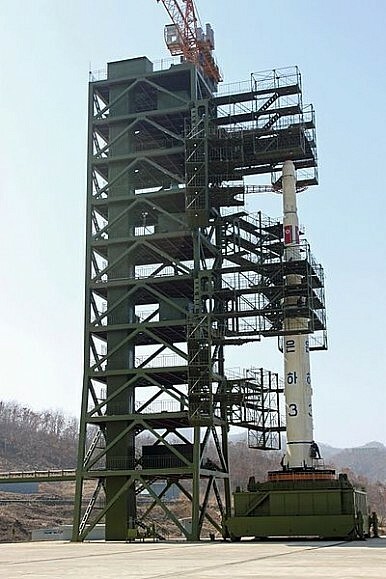 Specifically, Seiler told reporters in South Korea that the recent nuclear deal with Iran demonstrates that “value and possibilities that negotiation bring.” Noting the possibility of the Iran deal serving as a model for North Korea, Seiler continued: ”[The Iran deal] demonstrates again our willingness, when we have a willing counterpart, and it demonstrates our flexibility when the DPRK makes a decision that it wants to take a different path,” he added. While there are signs of a continuing thaw in China-Japan relations, the state of Japan-South Korea relations remains rocky–much to the United States’ dismay. 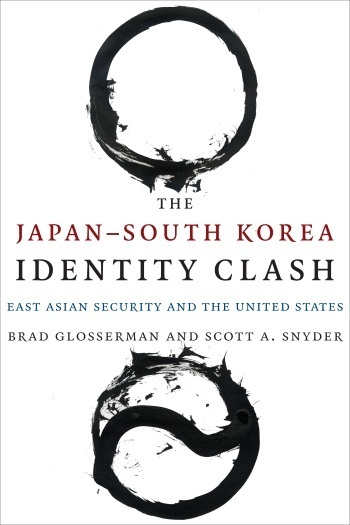 Historical issues continue to plague the relationship, but the root cause of tensions is much deeper, according to Brad Glosserman and Scott A. Snyder, the authors of The Japan and South Korea Identity Clash. The Diplomat‘s Mina Pollmann interviewed Glosserman, the executive director of Pacific Forum CSIS, and Snyder, senior fellow for Korea studies and director of the Program on U.S.-Korea Policy at the Council on Foreign Relations, about what’s troubling Japan-Korea relations–and how to solve the problem. The Diplomat: In your book, you argue that “competing notions of national identity” are the greatest stumbling blocks to more cooperation between Japan and South Korea. How did you measure or identify each state’s national identity? Furthermore, is there any dissent within either Japan or South Korea against the dominant “national identity” that you identified in their respective states? The media is doing a more than adequate job of covering the futile dance between the Eurozone “leaders” and Greece. But Greece is not the only country facing fundamental economic challenges. This article identifies other countries in the most dire straits and the problems they face. To select countries, five key indicators were selected: GDP growth rates, unemployment rates, government deficits, government debt, and current account deficits. Declining or negative GDP growth rates are often a precursor of emerging economic problems. High unemployment rates mean problems already exist. High government deficits means a country’s ability to generate additional fiscal stimulus are limited: the deficits lead to higher government debts, debts that can become unsustainable. Current account balances are the sum of trade and capital flows. Countries can only run negative current account balances until they have depleted their international reserves. The IMF collects these data on 189 countries. For purposes here, countries with populations of less than 500,000 were dropped. Then, the 30 countries with the worst 2014 performance on each of these indicators were selected. That narrowed the list to 74 countries. The list was paired further by choosing countries that performed worst on at least 3 of these 5 indicators. That left 12 countries. Those countries along with three others facing somewhat unique problems – Ecuador, Ukraine and Venezuela – are analyzed below. Libya and Syria are not included. Their serious economic problems are primarily attributable to wars. But at least for now, Libya is still pumping oil and Syria receives substantial economic assistance from Iran. Six countries in our selection use the Euro and Ecuador uses the US dollar. Situations in these countries are most precarious because without having a currency that can weaken, they can literally run out of money. Table 1 lists the six countries in trouble that do not have their own currencies. The numbers in red designate indicators where the country ranked as one of the lowest 30 countries in the IMF database. The commander of U.S. Cyber Command said last week that the Office of Personnel Management hack of millions of records of federal workers shows a new trend toward using Big Data analytics for both nation-state and criminal cyber attacks. “One of the lessons from OPM for me is we need to recognize that increasingly data has a value all its own and that there are people actively out there interested in acquiring data in volumes and numbers that we didn’t see before,” said Adm. Mike Rogers, the Cyber Command commander and also director of the National Security Agency. The theft of 22.1 million federal records, including sensitive background information on millions of security clearance holders, will assist foreign nations in conducting future cyber attacks through so-called “spear-phishing,” Rogers said, declining to name China as the nation state behind the OPM hacks. Additionally, China is suspected in the hack uncovered in February of 80 million medical records of the health care provider Anthem, which would have given it access to valuable personal intelligence that can be used to identify foreign spies and conduct additional cyber attacks. Rogers said the massive data thefts in recent months appears to coincide with massive spear-phishing hacking campaign around the world. Spear-phishing is the use of emails to gain unauthorized access to computers. The vast amounts of data that have been stolen also will assist counterintelligence operations by countries like China that seek to identify foreign intelligence officers posted abroad, he added. The Defense Department's new cyber strategy, just over two months old, is an outline of overarching goals fleshed out with narrower objectives and plans for implementation, hits on Pentagon cyber ambitions. Perhaps chief among them: The U.S. military has the means to retaliate in the digital realm and a willingness to do so. 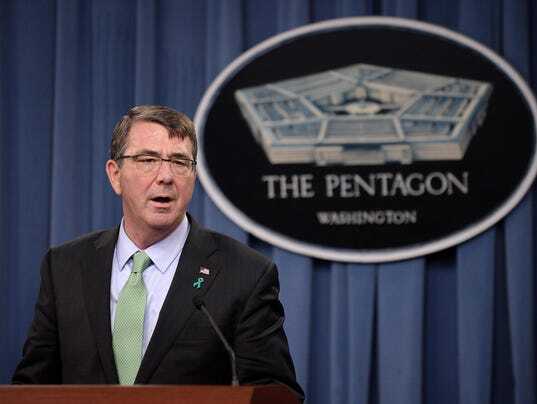 The strategy, released by Defense Secretary Ash Carter on April 22, lays out five central goals, many of which build on a 2011 Pentagon strategy that officially introduced cyber into the military domain. In addition, the new strategy furthers the ideas of offense and deterrence — previously touchy among defense officials. "The new strategy reflects achievement of the goals we had four years ago, which was to pull cyber into the mainstream military thinking," said William Lynn, the former deputy secretary of defense who introduced the 2011 strategy and is now CEO of Finmeccanica North America and DRS Technologies. "The most definitive thing about the first strategy was to treat cyber as a new domain of warfare, and that meant we needed to have a force dedicated to cyber; we needed to train, equip and maintain that force; we needed doctrine. Now it reads like a military strategy." For officials in Beijing, the success of the Iran negotiations is a sign of things to come. The marathon negotiations have paid off. Traditional diplomacy, something that Beijing has previously encouraged, did indeed work. Hailing China’s role in the process, Foreign Minister Wang Yi noted that the comprehensive deal “forcefully upholds the international non-proliferation system.” China’s role in reaching the negotiated outcome was furtherpraised by France, Russia, and Iran. In fact, China did not join the Iran negotiations untilMarch 2015. Still, could the successful outcome – as supported by Chinese involvement – serve as a basis for dealings with a nuclear North Korea? 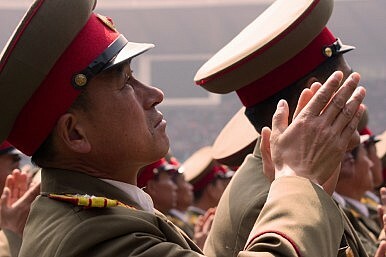 According to an op-ed published in The People’s Daily, “the facts show that dialogue and negotiation were the only correct and effective path to appropriately resolve the Iran nuclear issue, and that certain countries threatening to use force on Iran and imposing unilateral sanctions are not acceptable.” The commentary pointed to the applicability of the positive outcome on Iran for the North Korean nuclear issue. The six-party talks on the Korean peninsula between North and South Korea, the United States, Russia, China, and Japan regarding Pyongyang’s nuclear ambitions have been stalled since 2009. But the Chinese seem optimistic that the outcome of marathon negotiations on Iran give a “signal of hope” for the potential success of similar tactics vis-a-vis North Korea. Former DHS Secretary Michael Chertoff joins the league of technologists who have come out against the FBI’s push to put holes in privacy technology. ASPEN, Colo. — As top national-security officials continued to argue that U.S. companies should build government-only backdoors into encrypted devices and services, an unexpected voice rose in opposition. “I think that it’s a mistake to require companies that are making hardware and software to build a duplicate key or a backdoor, even if you hedge it with the notion that there’s going to be a court order,” former Homeland Security Secretary Michael Chertoff told an audience at the 2015 Aspen Security Forum. Chertoff said weakening encryption would increase the vulnerabilities for ordinary users, force “bad people” into using technology that would be even harder to decrypt, and could become a strategic vulnerability for the United States, especially if Russia and China demanded backdoor access. Published: Jul 16, 2015. Publicly Released: Jul 16, 2015. GAO analysis of the resources devoted to U.S. Special Operations Command (SOCOM) found that the number of authorized special operations military positions increased from about 42,800 in fiscal year (FY) 2001 to about 62,800 in FY 2014, which includes combat and support personnel. Even with this growth, special operations military positions constituted less than 3 percent of the military services’ FY14 total authorized force levels. Special operations–specific funding has increased markedly, but the Department of Defense (DOD) has not determined the total funding used to support special operations forces (SOF). Funding provided to SOCOM for special operations–specific needs has more than tripled from about $3.1 billion in FY 2001 to about $9.8 billion in FY 2014 constant dollars, including supplemental funding for contingency operations. However, these totals do not include funding provided by the services, which SOCOM estimates is more than $8 billion annually. GAO found that DOD has little visibility over total funding to support SOF, primarily because it has not established a requirement or methodology to capture and report this information. Until DOD has more complete information on total funding to support SOF, decision makers will be unable to effectively identify and assess resource needs or weigh priorities and assess budget trade-offs. DOD has taken some steps to manage the increased pace of special operations deployments, but opportunities may exist to better balance the workload across the joint force because activities assigned to SOF can be similar to activities assigned to conventional forces. Average weekly deployments of SOF personnel have increased from about 2,900 in FY 2001 to about 7,200 in FY 2014. SOCOM has taken steps to manage the effect of SOF deployments, but DOD reported that some portions of the force are still heavily deployed. GAO identified two factors that inhibit DOD’s ability to potentially share the burden of SOF deployments with the conventional force. First, DOD has not evaluated since 2003 whether activities performed by SOF could be conducted by conventional forces. Second, DOD’s current force-allocation process provides the Joint Staff with criteria to validate force requests, but does not systematically consider whether conventional forces could serve as an appropriate alternative to meet some requests for SOF. Unless the department more fully assesses whether opportunities exist to better balance demands across the joint force, the demand for SOF and the high pace of deployments that results is likely to continue. A copy of the 71-page GAO report can be accessed here.